After I weaned Luna at 2.5, she suddenly became a picky eater. She now turns her nose up to her once loved almond butter and scowls at anything that isn’t made of bread. I’ve tried everything to sneak in more nutrients but nothing gets past her stubbornness. Smoothies are sometimes met with enthusiasm, other times with a very loud NO! If it were up to her she would eat only bread and bananas. Concerned, my husband and I looked for a good quality (food based) multi vitamin for toddlers with no artificial colorings, additives, synthetics etc. but we came up dry. We did find liquid vegan DHA, (which has been relatively easy to sneak into her food), though, we knew she needed more for her little growing body. I decided to make my own with herbs (of course). I made a gylcerite because its easy to administer, less dosage, its portable, and tastes better to a toddler than an alcohol based tincture. Tea of the same or same, or the same, blend is also great if your toddler is into it. I add a little almond milk and honey and use cinnamon as a flavoring. Luckily, she loves tea! Alfalfa~ Known as natures multivitamins, alfalfa has been used in cases of malnutrition and prolonged illness. It contains vitamins A, C, and K, niacin, beta~carotene, riboflavin, folic acid, calcium, magnesium, iron, potassium and bioflavonoids. Raspberry leaf~ Very nutritious for children! A great source calcium, magnesium, iron and manganese. Rosehips~ High concentration of vitamins C, A and E. Also slightly sour and very yummy! Spearmint~ soothing to the digestive system. 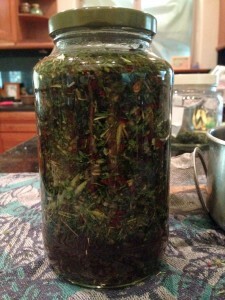 Adds a sweet and yummy flavor to the tincture. Licorice is another one that could add a yummy flavor to the recipe instead. 1.) Fill jar with 4 tbsps of each herb. Should be about half of the jar. 3.) pour hot tea over the herbs until they are covered. 4.) add glycerin until there is about 1-2 inches at the top of the jar. 5.) stir the mixture to be sure there is no air, cap the jar, label it with herb names and date and place in a cool dark place for 2 weeks or more. 6.) strain in a cheese cloth, nut milk bag or coffee filter. I prefer fabric filters over coffee filters because you can squeeze it at the end. 7.) Pour glycerite into a dark amber bottle, label and cap. Viola! Now get your toddler to be really excited about her very own special vitamins!